Posted by Lorea Thomson on Tuesday, November 19th, 2013 at 9:15pm. It is an undisputed fact in the luxury real estate market when someone is looking for uncompromising service, membership within the Who’s Who in Luxury Real Estate is advantageous. 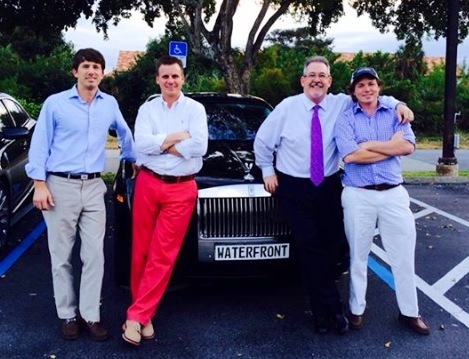 Waterfront Properties and Club Communities has been a member of this discerning network for many years. Who’s Who is a collection of the finest luxury real estate brokers and firms from around the globe. Bonneau Ansley, and Hil Harper of The Ansley Group, #1 Team at Harry Norman Realtors, and Mark Spain, CEO, of the prominent Mark Spain Team, of Keller Williams Realty International #1 Team, recently visited the Waterfront Properties and Club Communities corporate offices located in Jupiter, Florida. Mark’s team has successfully sold and closed over $1billion dollars in closed sales volume in his career. They specialize in residential home sales throughout metropolitan Atlanta and have sold 1400 homes year to date. The Ansley Groups focus is on luxury homes in beautiful Buckhead and they dominate the market in many “in-town” desired neighborhoods with nearly $100,000,000 in luxury sales year-to-date. Rob Thomson, Managing Partner of Waterfront Properties and member of Who’s Who in Luxury Real Estate’s exclusive “Billionaire’s Club” (for agents selling over $1 billion dollars in closed sales volume in his/her career) hosted the visit from the Atlanta associates. Together, Rob, Bonneau, Mark, and Hil exchanged ideas pertaining to high net worth demographics, market trends, team building ideas and training, technology solutions, and recent innovations in the real estate industry both nationally and internationally. Ansley and Spain visited the recently expanded offices of Waterfront Properties and exchanged ideas with the professional staff and agents. Waterfront Properties is a leader in waterfront brokerage and highly sought after for their successful marketing strategies, internet presence, and effective sales associates and buyer’s agents. For 25 years, Waterfront Properties and Club Communities has been a leader in luxury waterfront property. Let us access a national or global network of properties for you.